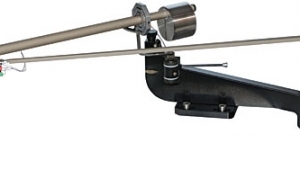 One problem facing designers of linear arms is how to drag the arm's mass laterally across the record surface. Another is how to route the wires from the sliding arm to a fixed termination point without impeding the arm's freedom of movement. 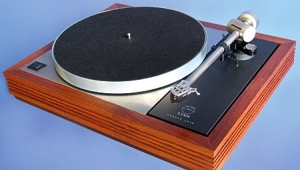 Noisy, tweaky, motor-driven servo systems have been used on a number of linear designs both ambitious (Rabco, Goldmund, B&O) and low-tech (plastic turntables from many mainstream manufacturers). But even the best of these require the loss of tangency to signal the servo correction system to move the arm along the track. 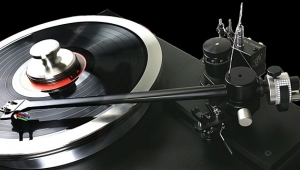 The correction inevitably overshoots or undercorrects to some degree; the result is an arm that wiggles its way across the record, creating potentially greater tracking errors—and more of them—than you'll find with a properly set-up pivoted arm. 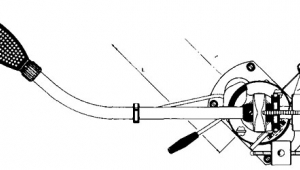 The ideal is for the cartridge's cantilever to maintain perpendicularity to a radial line drawn across the grooves. This can probably never be achieved by servo-type linear designs, even if, from afar, they look as if they are, and even if many audiophiles remain loyal enthusiasts. 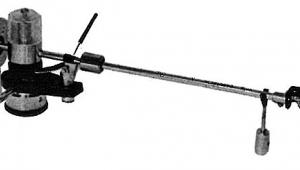 An upgraded iteration of the Souther linear-tracking arm, built and currently marketed by Clearaudio, uses a different scheme. A very short, low-mass rod rides on wheels along a pair of low-friction quartz rails. Discussion of the design tradeoffs is best left to a full review, but I remain skeptical about this arm's ability to maintain true tangency to the grooves as it rides the rails. The virtually frictionless air-bearing designs originally produced by Maplenoll and Eminent Technology were both designed by Eminent's Bruce Thigpen. In these arms, the bearing is fixed; it's the rail that moves, with the armtube attached to it. 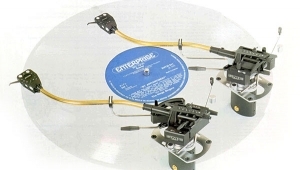 Eminent still sells its ET2 arm; a heavily modified edition of the original Maplenoll design can be found on Walker Audio's Proscenium Gold turntable. 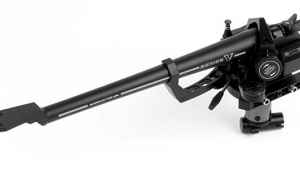 Finally, a number of air-bearing designs use a fixed rail and move the bearing, which has the considerable advantage of moving a far lower mass across the record surface. Included among these are the Versa Dynamics and Forsell (neither any longer in production), and the Airtangent, Rockport, V.Y.G.E.R., and, now, the Kuzma Air Line. These designs vary in bearing mechanics and air flow, as well as in overall build quality and ergonomics. 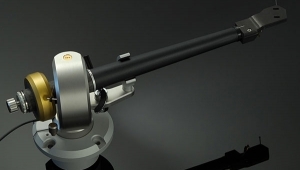 What Franc Kuzma's Air Line arm ($8000) lacks in originality is more than made up for in its superb execution, high build quality, and Kuzma's innovative upgrades to what must have been his obvious inspiration: Andy Payor's Rockport tonearms. The Air Line is in some ways even more practical and easier to use than the Rockport Series 6000, which I reviewed in the May 1996 Stereophile (Vol.19 No.5). 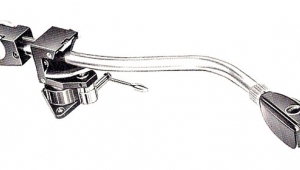 Like the pivot bearing of a conventional tonearm, the air bearing of a linear-tracking arm must be free to move in the vertical and horizontal planes, and not at all in any other. Too tight a tolerance and you restrict movement, too loose and you end up with sloppy geometry. The goal is for the arm and cartridge to track across the record with perfect tangency to the groove and zero play fore and aft. Though Kuzma's air bearing superficially resembles the Rockport 6000's, it's a fundamentally different design. Kuzma uses what's called a porous-wall air bearing in which pressurized air flows through thousands of tiny holes. Rockport uses a groove-compensated bearing, which has lateral grooves in the bearing wall. Kuzma supplies a remarkably quiet Sil-Air oil-cooled compressor and a sophisticated and effective system for removing both the water that's squeezed out of the compressed air, and any oil that might otherwise get sprayed into the system. The compressor is capable of running at around 12 bar (ca 120psi), but air bearings don't need nearly that much pressure. The Air Line's porous-wall bearing operates at around 4 bars (ca 60psi), or around four times the Rockport's pressure. However, that doesn't mean the Kuzma bearing is four times stiffer than the Rockport's, or even as stiff. There are too many variables involved to draw a blanket conclusion like this. The Sil-Air pump is far quieter than the one Rockport supplied with the 6000, but because it includes an air reservoir and pressure-sensing system, it emits a rather loud hiss, like an air brake's, after the compressor has refreshed the reservoir and shuts off. The shutoff can send a noise spike through the AC; I was advised to use a line separate from the one my audio system was plugged into. Kuzma told me that a fix is in the works, but the hiss means you need to locate the compressor out of audible range. Fortunately, you don't need to visit the compressor to turn it off, or even to keep tabs on the pressure. Closing a small valve on the arm maintains air pressure, which effectively keeps the compressor shut down. A neat little gauge built into the end of the air-carrier rod, which runs parallel to the bearing rail, tells you if the bearing is sufficiently pressurized. "In conventional pivoted arms the arm/cartridge system moves vertically and horizontally around a common point; thus, horizontal and vertical effective masses are very similar. In linear trackers there is a big difference between the effective vertical and horizontal masses. Being a pivoted system in the vertical axis, a linear tracker's effective vertical mass is low because it consists of the relatively short armtube and cartridge. 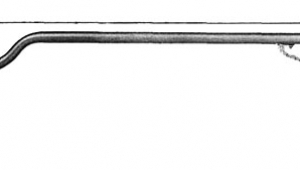 Horizontal mass is much larger: it includes the entire arm/sleeve assembly as well as the cartridge, all of which must be carried across the record and which do not benefit from being a pivoted system. 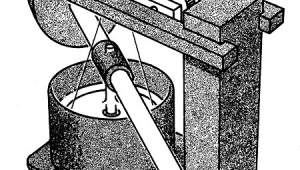 "Hang a small weight on the end of a spring and it bounces at a fairly high frequency over a short distance. Put a bigger weight on the spring and the rate of movement slows while the excursion length increases. 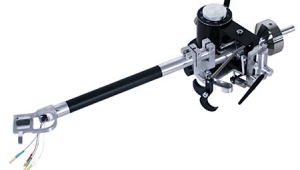 The high mass of a linear-tracking arm in the horizontal axis can create a very nasty low-frequency resonance. 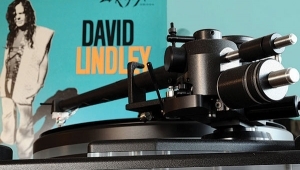 The eccentricities due to the off-center pressing of virtually every LP made will excite this resonance as the system moves back and forth trying to track the shifting groove.